(ok, so apologies to Joyce Kilmer). War Kings 2018 is now less than 7 weeks away, so time to switch to high gear. 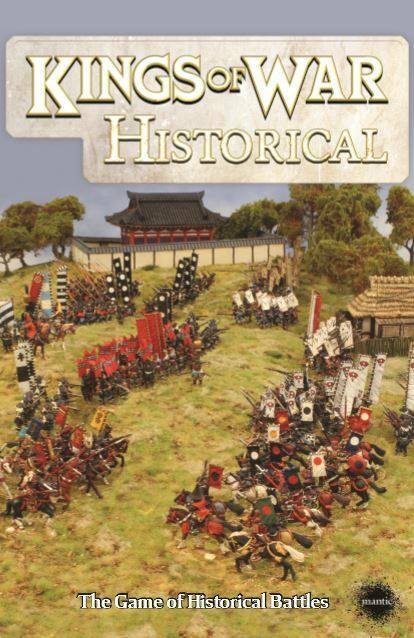 And that means repairing terrain and building new pieces as needed. And the first thing - trees. I picked up neoprene forest mats from Hidden Forest Gaming (a sponsor!) 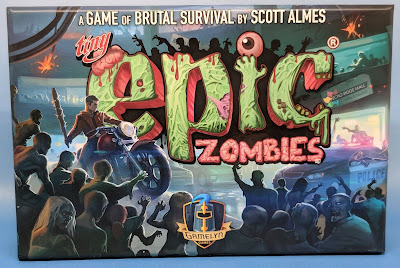 a while back, and recently bought more so that I have enough for the (hopefully) 20 tables we will be running (well the maximum we will be running). 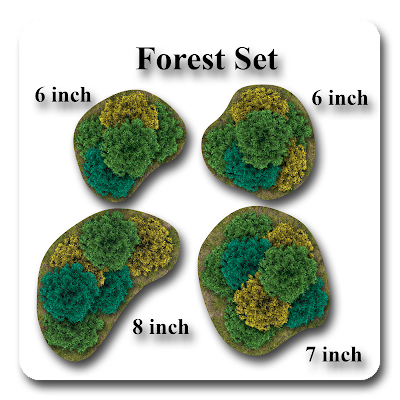 I really like these, as they are as durable as the full table mats, and easily depict the area of the forest. I add a few trees on top of each to give them some 3D effect and make the table look better - but anyone who plays tabletop miniature games knows that the trees inevitably end up on the side of the board out of the way so units can move through the woods. 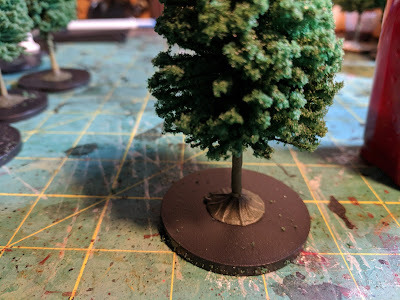 These look much better than the green pieces of felt I used to use. 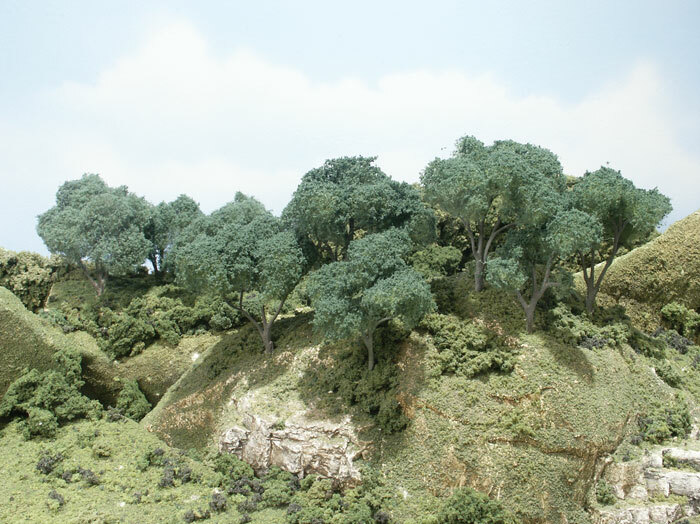 Currently I have four types of trees in my collection. 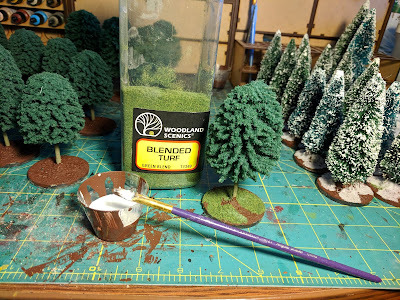 The first (and my least favorite right now) are Woodland Scenics Hardwood Forest. These are plastic armatures that you bend into shape, paint, then glue foliage onto. 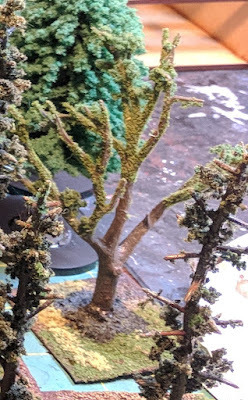 The problem I have had is that the foliage doesn't stay together, so it falls off, just leaving the branches with green on them. I have forty of these. 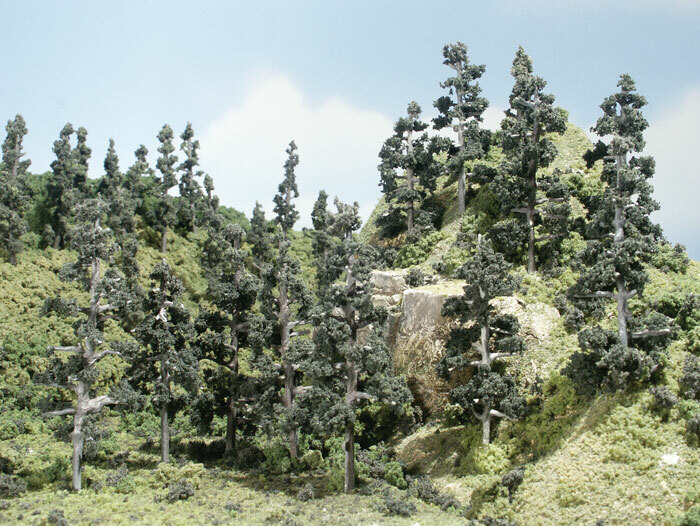 The next forty are also by Woodland Scenics - their Pine Forest. 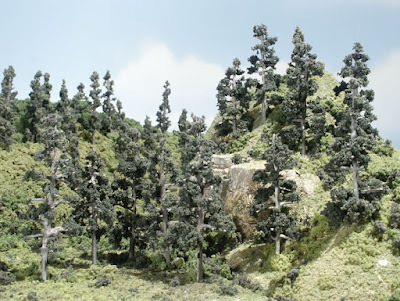 These are similar to the hardwood but, like pine trees, are taller and thinner. they seem to hold the foliage better, so look better. I also have 40 of these. Both of these are over ten years old, and have square bases on them. 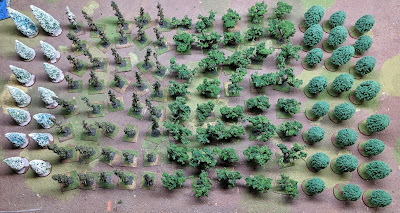 They were originally built for a Confrontation scenario - so the bases are actually marked to show exactly how close a figure has to be in order to cut down the tree. 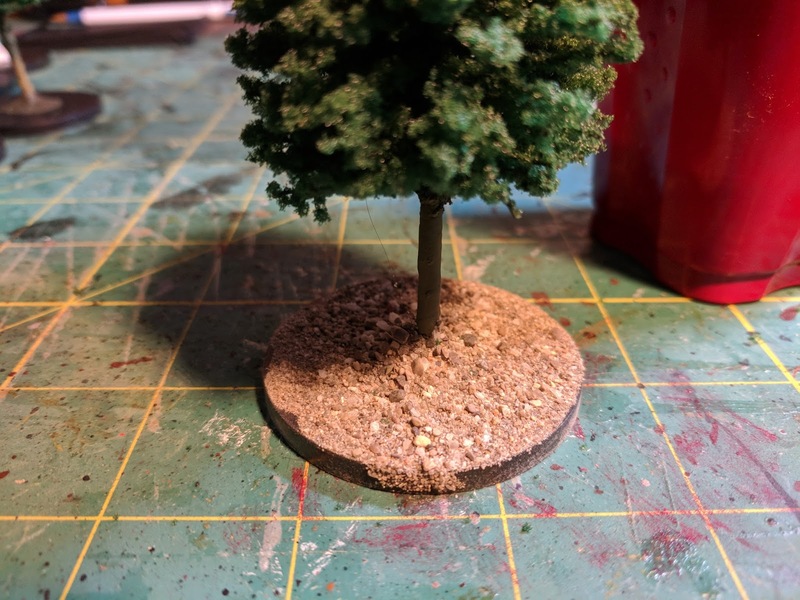 This black square in the base doesn't seem to detract from them at all (as most trees will have an area around the trunk that has too much shade to grow. 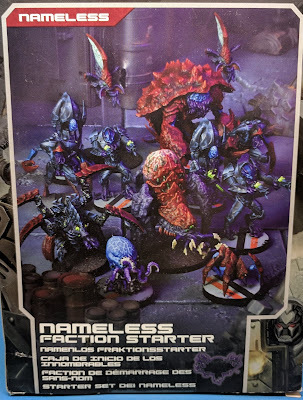 I had ten of these that had broken off their bases and had to be pinned back on. 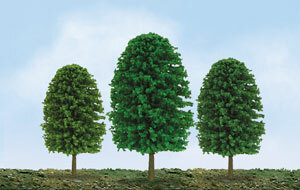 I recently picked up a set of JTT & Partners Econo-Trees - a bag of 24 pre-build trees. 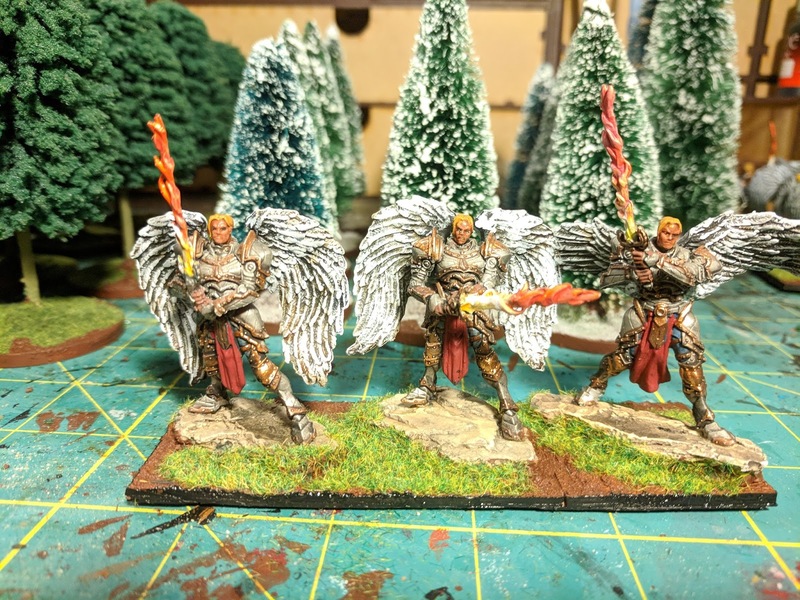 They need basing however. 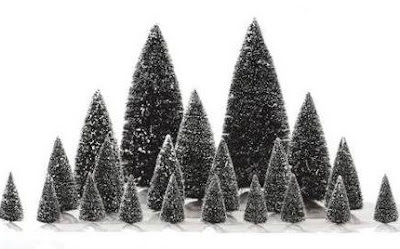 I don't know who makes the last trees I have - you can find them at craft stores usually starting in October - but the cheapest is if you can find any left after Christmas. These are pines with snows on them, and are often used for Christmas scenes. 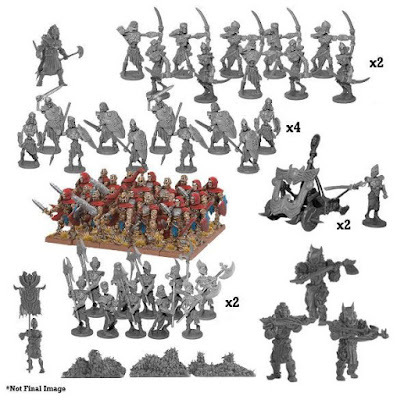 I found 14 of them, and they also need basing. 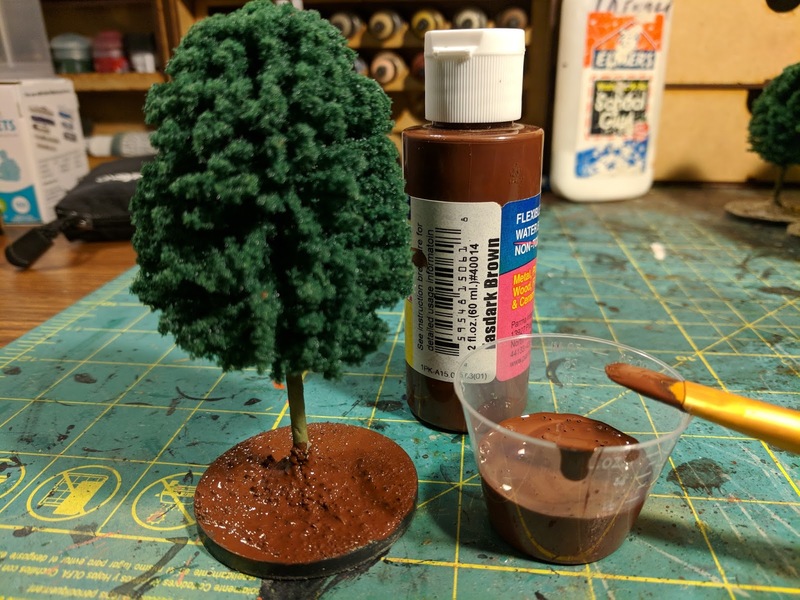 Well I started my day feeling like Bob Ross making happy little trees. Or at least making them all stand up on bases. 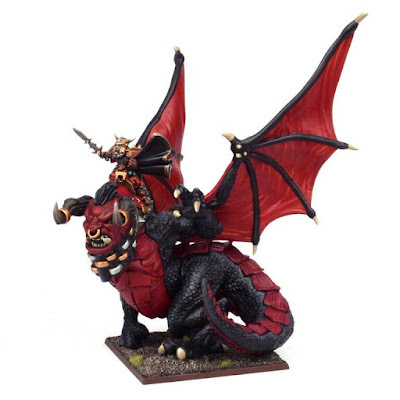 This was simply a matter of gluing them to 50mm Reaper round bases using normal plastic glue. I then pinned and super glued the broken ones together as well. My desk is looking like Arbor Day! 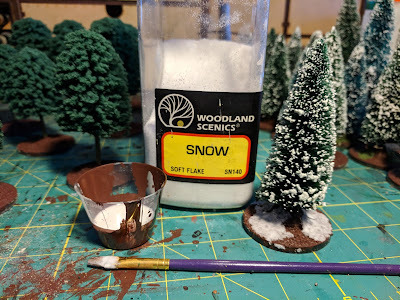 For the snowy trees, it makes sense to add snow to their bases. Once again thinned pva glue, and woodland scenics snow (instead of sand). You don't generally want to cover the base, instead leaving some dirt (and even some grass if you want) that you can see underneath. The rest got "grass". 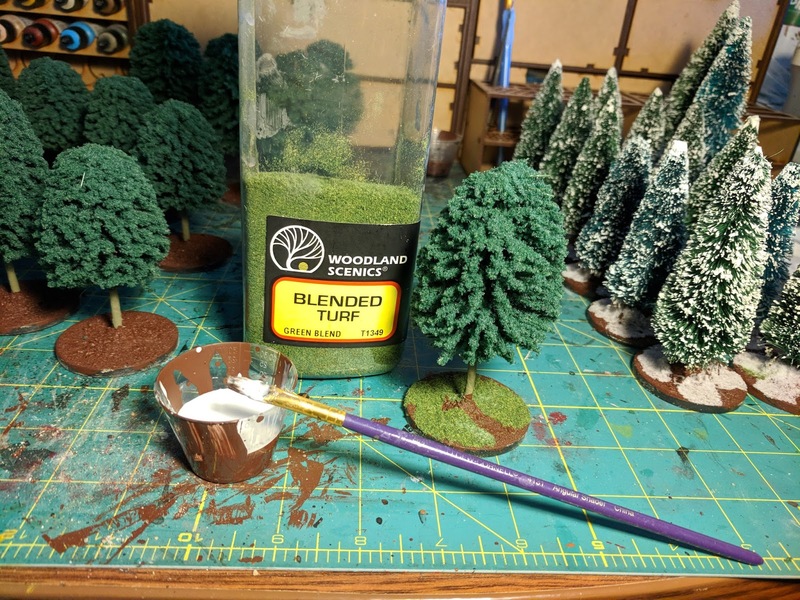 For my terrain I use Woodland Scenics Blended Turf because I can get it in the big shaker cans and it is cheaper than static grass. While I want the terrain to look good - people will almost never pay any attention to it except for how it affects the game. The final step is then edging the base. 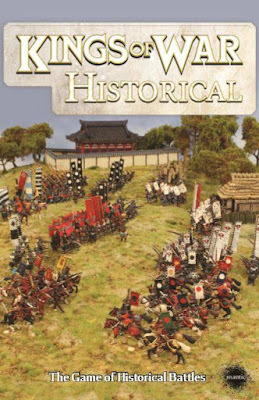 For my mini's and units I do a black edge along all the bases, this helps to frame the miniatures and make them look better. You can see his effect on this regiment of Elohi (and that is all 15 of them done - meaning I only have Samacris left to paint for my friend Jim's Basilean army). 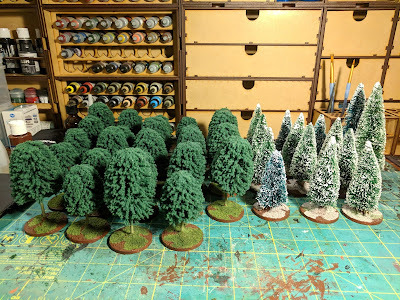 And thus the 38 trees are now based so they don't keep falling over when set up, and should look a bit nicer. I mentioned that I didn't like my original Hardwood Forest trees. Well I did take a break this weekend and headed down to Cincycon (amazing to be able to drive half an hour to get to an event!). I talked to some people from a brand new company doing scenic flock and basing materials - Huge Miniatures. This company web site is not scheduled to go live until today. 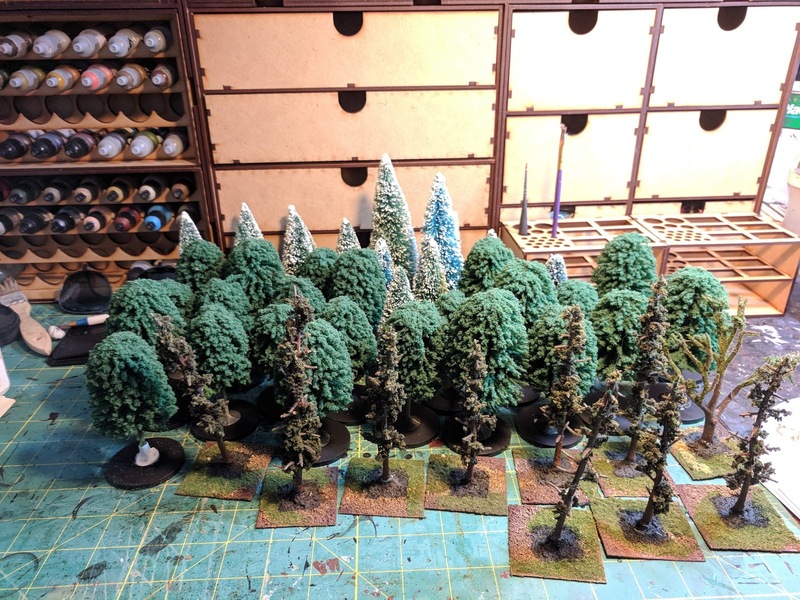 I bought some static grass from them, and talked a bit about terrain and my trees. Well it turns out that one reason I don't like my trees (and they are so sparse) is because I basically never finished them so many years ago. 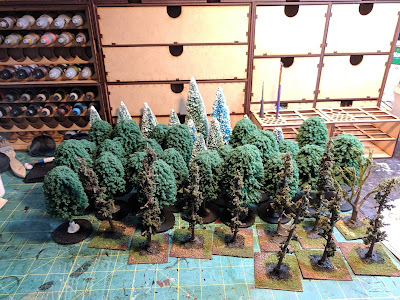 I spray glued the armatures and dipped them in the course turf, let them dry, and then shook them off and had very bare trees. What turf was left on them kept falling off everywhere. Well there was basically another step that I missed - to seal them. 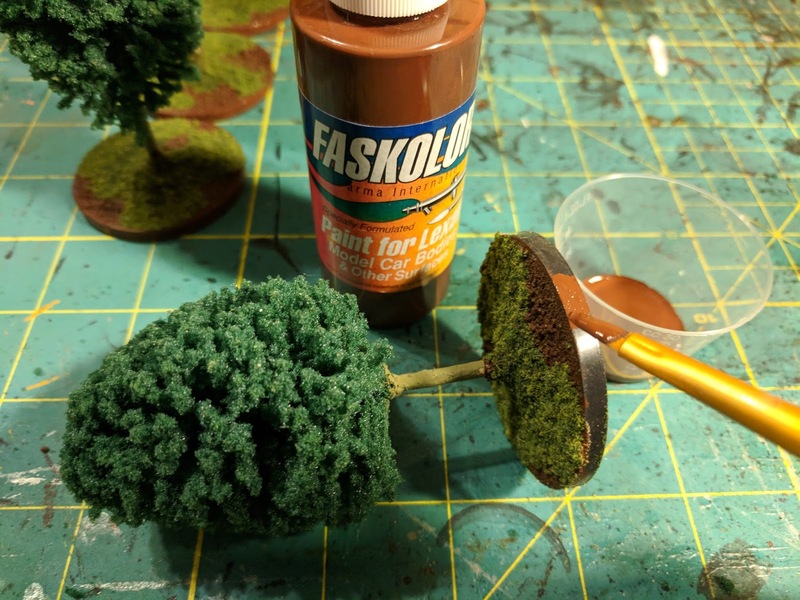 This is basically spraying the foliage with thinned pva (woodland scenics also sells a pre-thinned terrain cement in a spray bottle for this) and letting it dry - thus cementing the greenery to the armature. So I re sprayed all 40 trees, re dipped them in the big gallon bucket I have of the green foliage left over from all the kits I have built - and then after that set sprayed them with the pva to seal them. As you can see, they don't look all that bad now that they actually have leaves on them! Maybe it pays to actually read the directions some times. So much nicer, and so much less stuff falling off. I'm not going to redo the pines, as they don't look that bad (and I've also mixed all the colors, which is fine for these, but I would just want the dark green for the pines). 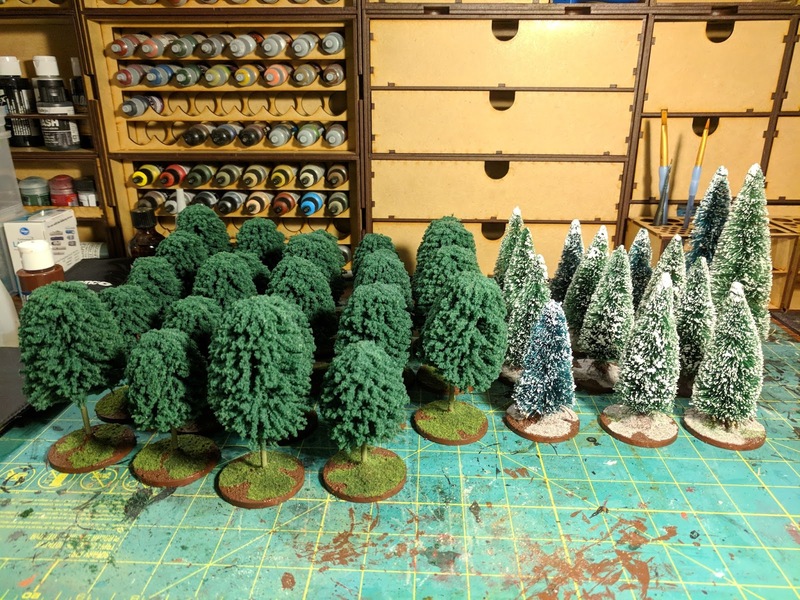 I figure now to show them all - if it looked like arbor day on my desk - now my game table has almost 120 trees drying on it. Now to get working on hills for War Kings (I only need between 2 and 22 more of those).